an agent (771) (q.v.) who deals in commodity or commodities, wholesale or retail, actually buying from manufacturer and selling directly or indirectly to consumer; usually specifically designated, e.g. book agent, colliery agent, cycle agent. a wholesale dealer or retail shopkeeper (q.v.) who sells oil and water colours, brushes, canvas, and other artists' requisites; usually retails pictures and prints as well. a retail shopkeeper (q.v.) who sells bread and flour confectionery; himself makes, or employs bakers (433) and pastrycooks (433) (q.v.) to make, such commodities. a retail shopkeeper (q.v.) who sells bibles, texts, tracts, and religious publications; sometimes sells from private house instead of from shop. a retail shopkeeper (q.v.) who sells books, periodicals, etc. a bookseller (q.v.) who also sells stationery and office requisites. a retail shopkeeper (q.v.) who sells retail boots, shoes, polishes, etc. (sometimes hosiery); sometimes employs workers on premises or outworkers to undertake bespoke orders for boots, etc. ; usually undertakes orders for repairs, employing repairers (412) (q.v. ), or sending such orders to trade repairers for execution; cf. boot and shoe maker (412). a wholesale dealer and/or retail shopkeeper (q.v.) who sells materials for building purposes, e.g. bricks, cement, lime, builders' ironmongery, paint, distemper, wallpaper; may also hire out scaffolding plant, e.g. poles, boards ladders. a wholesale dealer (q.v.) who sells meat; usually purchases live cattle from farmers (011) or cattle dealers (q.v.) and instructs drovers (966) to deliver to abattoir on arrival by rail or road; employs slaughterman (448) (q.v.) to kill and dress beasts; sells carcases to wholesale or retail butcher. a retail shopkeeper (q.v.) who sells pork, sausages, meat pies, brawn, trotters, black and white puddings, etc. ; sometimes makes and cooks pies, etc. on premises; cf. small goods maker (448). a retail shopkeeper (q.v.) who sells meat, sausages, etc. ; sometimes, particularly in country districts, himself kills cattle, sheep and pigs in public abattoir or in own slaughterhouse, or deputes slaughterman (448) (q.v. ); often manufactures sausages, cf. sausage maker (448), and sells pork, cf. pork butcher; stores meat in cold chamber. (q.v.) who supplies meat, vegetables, poultry, etc. for consumption on board ship. a wholesale dealer (q.v.) who sells meat and meat offals; cf. butcher, carcase. a retail shopkeeper (q.v.) who sells butter; sometimes makes it on premises; obsolescent. a retail shopkeeper (q.v.) who sells groceries, provisions, general household goods, e.g. soap, candles, hardware, and sometimes also sugar confectionery, books, stationery, mineral waters etc. ; cf. oil and colourman. a retail shopkeeper (q.v.) who sells grain, oats, pulses, hay, straw, cattle and poultry foods and medicines, seeds, rice, tapioca, haricot beans, flour, biscuits, etc. ; sometimes also sells sauces, bottled and dried fruits etc., and, less frequently, coal and coke; sometimes employs assistants to cut chaff, truss hay, etc., cf. shop assistant (775). a retail shopkeeper (q.v.) who sells cordage, canvas, ship's stores, and other furniture. deals in candles, tallow, fats, etc. see butcher, pork ; term used in foreign quarters, e.g. Soho. London. a retail shopkeeper (q.v.) who sells cheese, butter, eggs, and other provisions; cf. merchant, provision. (ii) a retail shopkeeper (q.v.) who sells fine chemicals, drugs, poisons, patent medicines and sundries, e.g. tooth brushes, and who, unless a member of a firm, co-partnership or limited company, under specific conditions, must have passed the Pharmaceutical Society's qualifying examination. a chemist (q.v.) specialising in sale of homeopathic medicines. a chemist (q.v.) who has passed major examination of the Pharmaceutical Society. a wholesale dealer or retail shopkeeper (q.v.) who sells all kinds of readymade clothing; sometimes also makes clothes to measure; cf. tailor, outfitter. a wholesale dealer or retail shopkeeper (q.v.) who sells sugar confectionery (sweets); (North of England) a retail shopkeeper who sells [flour (not sugar) confectionery. a wholesale dealer (q.v.) who undertakes to supply to consumers certain commodities in bulk according to agreement; sometimes specificially [sic] designated, e.g. army clothing contractor, coal contractor. a retail shopkeeper (q.v.) who sells milk, butter, eggs, and other dairy produce; often employs roundsmen (776) (q.v. ); may also deal with milk churns, tipping milk into cooler, separator, etc., as for dairyman (448). buys old furniture, pictures, pottery, china, and other articles of vertu, direct from private owner or at auctions, etc., and sells to public; usually keeps showrooms for sale of antiques; frequently repairs and renovates antique articles or employs workers for this purpose. a wholesale dealer or retail shopkeeper (q.v.) who sells china, glass or earthenware goods for household use. a retail shopkeeper (q.v.) who sells bicycles and bicycle accessories; usually lets-out bicycles on hire and undertakes repairs, generally employing assistants; cf. cycle repairer (229). a retail shopkeeper (q.v.) who sells pictures, prints, engravings, and similar productions; may sell china, glass or other works of art; may also buy and sell pictures for third parties and undertake commissions generally; sometimes frames pictures, employing picture framers (485) (q.v.). buys and sells horses; travels through country effecting purchases, etc., arranging for transport of horses, buying direct from owners or at auctions, either on his own behalf or, on commission, for clients; sometimes owns grazing farm for maintenance of animals awaiting purchase; (unusual) also breeds horses, cf. horse breeder (011). (ii) in Scotland, see chandler, ship. a general term for one who buys goods wholesale from manufacturer, merchant or importer, and sells them direct to consumer from office, shop or warehouse; see shopkeeper, retail. a retail shopkeeper (q.v.) who sells theodolites [sic], compasses, levels, etc., for professional use; may also be master scientific instrument maker (322) (q.v.) employing workshop hands. a retail shopkeeper (q.v.) who sells all kinds of cast-off clothing; buys second hand clothing by calling from house to house, and at auctions; purchases mis-fits from tailors; sells from private house, shop, store or market stall; repairs garments ready for sale as necessary. usually supervises conduct of a business distributing commodities to other wholesalers, retailers or directly to large consumers; purchases goods, often on sample, from importers, brokers, manufacturers, producers or other wholesalers, sometimes instructing brokers for this purpose; may import commodities direct, employing buying agents in British Dominions, colonies or foreign countries; transfers goods to own warehouses by own transport or by instruction to common carriers, or retains in public warehouse until sale is effected; usually employs staff to undertake duties in connection with purchase, sale and despatch of goods, including correspondence and book-keeping; may employ commercial travellers (773) or agents (771) (q.v.) to obtain orders and to sell on his behalf, or advertise, employing special staff or advertising agent for this purpose; displays samples of goods in showrooms for convenience of intending purchasers and arranges, by personal interview with buyer (772) (q.v. ), prices and terms of contract, if any; gives instructions for delivery of goods to purchasers by common carriers or his own transport, . if such facilities are not provided by purchasers; in own warehouses, may undertake, with necessary staff, certain manipulative processes, e.g., grinding, blending, roasting, mixing, filling, bottling, packeting, in addition to usual warehouse operations of unpacking, packing, labelling, weighing, checking, etc. a wholesale dealer or retail shopkeeper (q.v.) who sells silk, linen, and cotton piece goods, and other drapery. sells drapery goods on instalment system of payment, calling on customers at their homes, or employing tallymen (774) (q.v. ); may direct retail shop, but usually works from private house. a retail draper (see draper), specialising in sale of cloth, linings, trimmings, buttons, thread, and tailors' workshop requisites to tailors, dressmakers and general public. (ii) a retail shopkeeper (q.v.) who sells crude dry chemicals, paint ingredients and colours; usually also sells other goods, e.g. ironmongery, garden tools, lamps, soap. buys goods from manufacturers, importers and factors, and sells to firms in colonies or foreign countries; purchases and sells on own behalf, directing warehouse staff for storing, packing and exporting goods; or employs agents; or accepts commissions to ship and to sell abroad goods ordered by customers, does not necessarily handle goods but is responsible for clearing bills of lading unless actual shipping relegated to a shipping agent (730) (q.v. ); usually does not own vessels. a wholesale dealer (q.v.) who sells boots, shoes and slippers; may also sell grindery. buys and sells birds, dogs, cats, or other animals, usually from a shop; sometimes also breeds them. (ii) retails fish, etc., from stall or from barrow or small cart calling from house to house. a retail shopkeeper (q.v.) who sells cut flowers, plants, bulbs, seeds, etc., retail from a shop or stall; makes up bouquets, funeral wreaths, etc., and/or employs assistants for this purpose; decorates ballrooms, concert platforms, dining tables, etc., to order; sometimes sells retail flowers, plants, etc., from stall in market place; often cultivates flowers, etc., in own nursery garden, cf. florist (013). a wholesale dealer or retail shopkeeper (q.v.) who sells furniture for household or office purposes, carpets, soft furnishings, china, glass, cutlery; as a retailer, may also undertake decoration or erection of residential or business premises, employing necessary staff. supplies mills or factories with sundry requirements, e.g. machine belting, oils, grease, nails, rivets, shafting, machine parts, machinery manufactured or erected in own workshops, or first obtained from manufacturer (not himself); sometimes employs fitters (210), etc., and sends such to factories requiring repairs to machinery, new erections, etc. ; is also frequently an agent (771) (q.v.) for particular type of machine. a retail shopkeeper (q.v.) who sells fresh fruit; usually also sells fresh vegetables, etc., cf. greengrocer; sometimes sells from stall or barrow in street or market place, and may call from house to house. a retail shopkeeper (q.v.) who sells furs and fur garments; usually also undertakes repairs, cleaning and storage of furs; sometimes manufactures furs into garments, for sale in own shop, employing cutters (338), machinists (332), liners (332) (q.v. ); cf. furrier (332). a wholesale dealer or retail shopkeeper (q.v.) who sells gloves; usually also deals in hosiery, handkerchiefs and general outfitting. a wholesale dealer or retail shopkeeper (q.v.) who sells jewellery, other gold, silver and plated goods, watches and clocks and sometimes also repairs them, if necessary employing watch repairers (323) (q.v. ), etc. a retail shopkeeper (q.v.) who sells fresh vegetables, and usually also fruit, etc., as for fruiterer. a wholesale dealer or retail shopkeeper (q.v.) who sells tea, coffee, spices, condiments, sugar, dried fruits, rice, biscuits and similar articles. a wholesale dealer or retail shopkeeper (q.v.) who sells textile small wares, e.g. linings, trimmings, tapes, pins, needles, thread, etc. purchases poultry, eggs and dairy produce in country districts from farmers, poultry farmers (011) (q.v. ), cottagers, etc., and sells to wholesaler, retailer or consumer. a retail shopkeeper (q.v.) who sells hats and other headgear for men and boys, umbrellas, sticks, etc. ; is usually also general outfitter (q.v.). (English and Scotch dialect terms), see dealer, horse. a retail shopkeeper (q.v.) who sells hosiery and other knitted goods; is usually also an outfitter (q.v.). buys, either direct or through agents, raw material, produce or manufactured goods, from colonial and foreign markets and sells to home merchants, manufacturers or retailers; transports goods in own vessels and handles goods in own warehouses or operates through office only, storing goods in public warehouse, packing, despatching, etc., of goods being done by wharfingers (732) (q.v. ); usually sells from approved samples. pays regular and surprise visits to branch shops of multiple shop firm; examines books, method of working, discipline, etc., and reports to firm's headquarters. a retail shopkeeper (q.v.) who sells tools, household utensils, cutlery, general hardware, and in country districts, agricultural machinery and seeds; often combines with trade of electrical engineer (305), hot water fitter (210) and gas fitter (235) (q.v.). buys job lots of goods (bankrupt or salvage stocks, etc. ), or cattle at markets, auction sales, etc., and sells to retailers or direct to public. purchases coal at agreed price at pit head; loads into own trucks and despatches to coal merchants (q.v.). (ii) sells books, etc., from retail shops and subsequently exchanges them for other books on payment of small fee. deals wholesale or retail in textile fabrics—silk, woollens, etc., cf. draper; more rarely, deals in any small wares. a wholesale dealer (q.v.) who buys goods wholesale from manufacturers or other merchants, and sells to other merchants or retailers; rarely,as for dealer, retail; usually specifically designated, e.g. feather merchant, hide and skin merchant, hop merchant. a retail dealer (q.v.) in coal or coke; purchases from mine owners, or landsale managers (colliery) (q.v. ), discharging coal from trucks in own siding, and/or purchases from gas companies; sells direct to consumer on orders given at office by purchasers or by employing coal hawkers (776) (q.v.). a wholesale dealer or retail shopkeeper (q.v.) who sells bacon, lard, butter, cheese, eggs, tinned foods, and groceries; cf. grocer. a tailor (q.v.) who sells retail bespoke clothing and employs tailoring workers; sometimes sells ready made clothing. a wholesale dealer (q.v.) in cloth and trimmings, i.e. linings, buttons, thread; supplies tailors, drapers (q.v.). buys teazles from teazle grower (011), and sells them, sorted and made-up into staves, to cloth manufacturers; usually employs teazle clippers, cutters and sorters (989), and teazle packers (949) (q.v.). (ii) wool stapler (old English term); a wholesale dealer who sells raw English wool; generally works in locality wherein wool is grown; buys from farmers at fairs; classifies, cf. wool classer (360), and sells from samples in wool exchanges, e.g. at Bradford. a retail shopkeeper (q.v. who sells hats and other headgear for women and children; sometimes employs assistants, cf. milliner (408). a retail shopkeeper (q.v.) who sells newspapers, magazines and other periodicals; usually buys from publishers on "sale or return"; frequently also sells tobacco, cf. tobacconist. sells retail, from shop or store, oils, paints, candles, hardware, brushes, cleaning materials, etc. ; cf. chandler. general term usually applied to retail shopkeeper (q.v.) selling men's clothing, cf. hosier; sometimes also sells women's clothing, sports and games requisites, etc. ; sometimes specifically designated, e.g. men's outfitter, sports outfitter, women's outfitter. sells perfumes from retail shop; often in connection with hairdresser's (920), or as adjunct to chemists', drapers', etc. business (q.v.). a qualified chemist (q.v. ), wholesale or retail trade. a retail shopkeeper (q.v.) who buys and sells used and unused postage stamps of all countries from retail shop or through post; may buy and sell private collections or merely sell same on commission; also sells stamp collector's accessories, e.g. albums, mounts, etc. (ii) a retail shopkeeper (q.v.) who sells poultry, game, rabbits, etc. ; usually also sells fish, cf. fishmonger. a retail shopkeeper (q.v.) who sells usually food, provisions, etc. (ii) buys large quantities of corn, provisions, etc., in a market and sells again at a profit at or near the same spot. a retail shopkeeper (q.v.) who sells saddlery and harness (sometimes other leather goods also); usually makes saddlery, etc., or repairs it, in attached workshop employing saddlers (311) (q.v. ), etc. a sales manager (q.v.) of engineering firm; is usually a qualified engineer. in charge of sales department of a firm; controls and instructs commercial travellers (773) (q.v. ); organises advertising and his firm's display at trade or other exhibition; conducts correspondence on matters connected with sales; interviews prospective buyers; may himself solicit buyers. a wholesale dealer (q.v.) who buys scrap metal from ship yards, manufacturers, etc., and sells to other, usually smaller, manufacturers able to utilise same. a wholesale dealer or retail shopkeeper (q.v.) who sells flower and vegetable seeds; usually deals also in cut flowers, plants, garden implements, etc. ; cf. seedgrower (013). sometimes owns one or more vessels in mercantile marine. usually himself supervises conduct of a business distributing commodities direct to consumers; purchases goods from importers, wholesalers, manufacturers or producers, often from samples shown by commercial travellers (773) (q.v.) 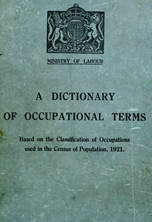 employed by such firms, or by visiting show rooms wherein samples are displayed; less frequently orders by post goods advertised in trade press; sells goods to consumers from shop; utilises shop windows as a means of displaying goods to the public, and may employ specialist to dress windows; in large establishments, may advertise extensively in public press, employing large staff or an advertising agent (779) (q.v.) for this purpose or for preparation and issue of catalogues, etc. ; frequently has a warehouse on shop premises wherein stocks are kept and from which purchases are despatched; if necessary, delivers goods to customers by own conveyances, or gives instructions for delivery of goods by common carriers; in large establishments, instructs heads of departments in business policy, and employs staff to undertake duties in connection with sale, purchase, stockkeeping, despatch and delivery of goods; in smaller establishments or in one-man or family concerns, usually himself undertakes purchase, correspondence, book-keeping or other duties. a mercer (q.v.) who sells mainly silk goods. as for goldsmith and silversmith. a retail shopkeeper (q.v.) who sells all kinds of stationery and office requisites; often combines with business of bookseller (q.v. ); sometimes undertakes orders for printing which he carries out on premises or sends to printer (529) (q.v.) for execution. a stationer (q.v.) who also sells fancy goods of paper, china, leather, etc. a stationer (q.v.) who specialises in requirements of lawyers' offices. buys straw plait at markets from home-worker, and sells to straw hat manufacturers; obsolescent, as straw plait is largely imported. a wholesale dealer (q.v.) who sells accessories incidental to some business; usually specifically designated, e.g., hairdressers' sundriesman, druggists' sundriesman, tobacconists' sundriesman. a retail shopkeeper (q.v.) who sells bespoke and/or ready-made suits, overcoats, ladies' coats and skirts, etc. ; for clothing made to measure, may also have workshop, or homeworkers, or may "give-out" work to be made. see draper, credit ; cf. tallyman (774). a wholesale dealer or retail shopkeeper (q.v.) who sells tobacco, snuff, cigars, cigarettes, and smoker's requisites; (retail) often also sells walking sticks; holds State licence. (ii) see dealer, retail, and wholesale. a retail shopkeeper (q.v.) who sells trunks, bags, etc., of leather, canvas, etc. ; sometimes does repairs and/or makes trunks, etc., in attached workshop, employing trunk makers (leather, etc.) (345) (q.v. ), etc. may also undertake to warehouse goods for other merchants. a retail shopkeeper (q.v.) who sells edible oils, sauces, macaroni, preserved foodstuffs, etc., especially those of foreign origin. a retail shopkeeper (q.v.) who sells watches, clocks, jewellery, etc. ; generally undertakes repairs in attached workshop; rarely makes nowadays. see merchant, wool; cf. wool stapler (360).